Paris Divise en 20 Arrondissements. 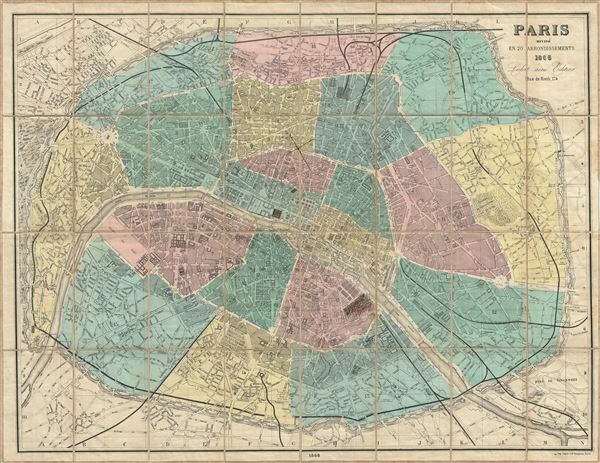 This is a fine example of the 1866 folding map of Paris, France by Ledot Freres. It covers the old walled city of Paris and its immediate vicinity. Drawn to illustrate Napoleon III and Georges-Eugène Haussmann's revolutionary modernization of Paris, this map shows the 1860 repartitioning of the arrondissement system into 20 distinct zones as well as Haussmann's broad networks of avenues and thoroughfares. Elegant, highly detailed engravings reveal important buildings, parks, streets, and fortifications. The map is dissected and mounted on linen in 32 panels for easy folding and unfolding. Published by Ledot Freres from their offices at 174 Rue de Rivoli, Paris. Ledot Freres (fl. c. 1850 - 1870) was a publishing house active in Paris during the mid-19th century. The Ledot brothers focused scientific material such as ornithologies. Ledot Freres also published a number of maps of Paris and view books for the tourist market. Their offices were located at 168 Rue de Rivoli, Paris. Very good. Dissected and mounted on linen. Minor wear along original fold lines. Pen marks cover the Jardin de Plantes and the Louvre.